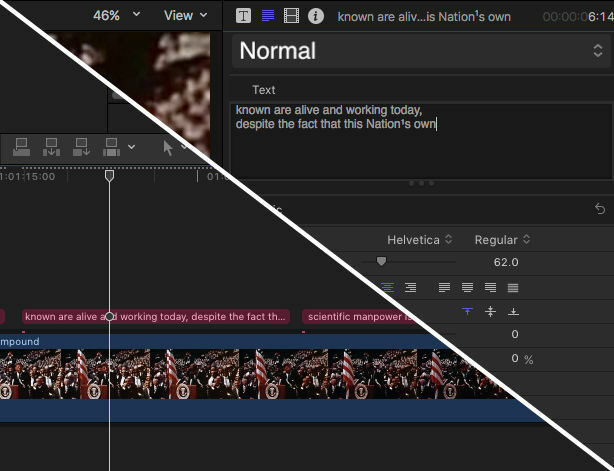 Subvert – Edit with subtitles in Final Cut Pro X. Subvert expands on Final Cut Pro X's captioning capabilities. It makes editing with captioned footage easy and powerful. After processing your subtitle and FCPXML files in Subvert, your footage clips will transform into compound clips containing captions or titles. With markers and keywords, you can read the transcript text right in your browser. Captions come along with the source footage and appear in the viewer. Show or hide all captions instantly by changing the visibility of their role in the timeline index window. 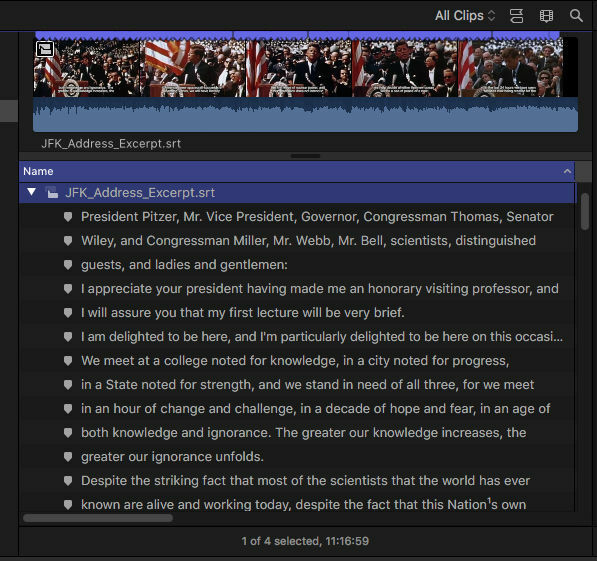 Since you're working with compound clips, you can edit the captions they contain to fix errors or adjust the text. The changes you make will propagate to all instances of that clip across all projects. Right-click on captioned compound clips and "extract captions" to see them on your project timeline. Edit normally and captions will automatically stay in sync since they're connected to the clip. After your project is finished, export an FCPXML and bring that into Subvert. The app will detect the captions (or any title with a specified role) and create a properly timed SRT or SBV subtitle file for final delivery from the edited project. your transcript and subtitle workflow as you see fit. Subvert can import SRT, SBV, Avid DS, and regular transcript files in plain text and MS Word formats. Captions can be integrated into FCPX as markers and keyword ranges, allowing you to read transcripts straight in the browser and search for specific words inside lengthy dialogue. Change the font style and color of the subtitle laid over your video. Optionally reformat line breaks to fit the width of the screen better. 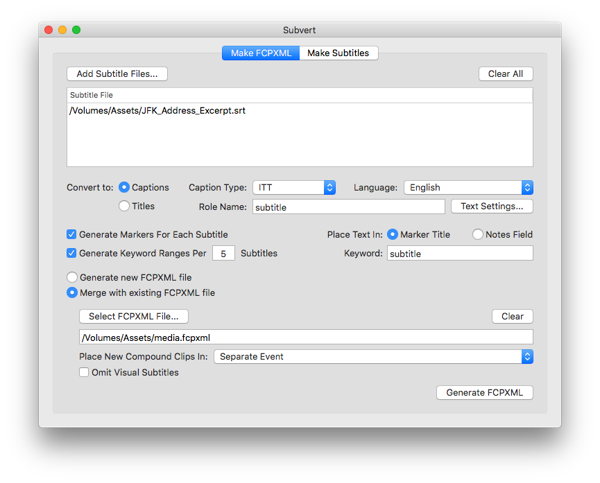 When you’re done editing, use Subvert to convert an FCPXML of your edited project back into a subtitle file. Then you’ll have instant subtitles for your finished video without transcribing again. Buy Subvert on the Mac App Store.